Byron, a celebrity in his own lifetime, flees London to escape gambling debts and the rumours his ex-wife has been spreading. He takes with him a young doctor, John Polidori, who has literary ambitions of his own. The young Claire Clairmont’s obsession with the poet, makes her convince her step sister, Mary Godwin, to accompany on a wild goose chase round Europe. Mary and her lover Percy Bysshe Shelley, are unwelcome at home and take the opportunity. From that summer, a part of literary history was written, but it also had a huge impact on the lives of those involved. You couldn’t make this stuff up. Well you could, but then it would be written off as some torrid, historical romance. As a group of writers, they wrote many letters to each other, kept journals and were written about in the press. Byron’s celebrity status at the time, must have helped the preservation of these documents. There is little speculation here, it’s a story woven together from the words left behind. Readers may find it a little dry in places, but this is more than made up for in the snippets taken from their accounts. 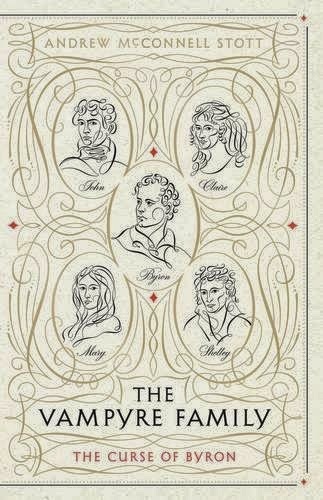 Polidori was strikingly handsome, though he smiled only rarely, possessed of a remarkable profile that teenaged girls sketched dreamily on the back of letters. Like so many of his peers, Polidori adopted the Byronic style, dressing mostly in black and going about bare-necked with his shirt collars down in a study of artistic dishevelment. Indeed, he looked more Byronic tham Byron, who, it was said, 'barely escaped being short and thick'. The book focuses a lot on Claire and John, two people I knew very little about but really had a tough time of it. There are plenty of passages dedicated to the more literary leanings of the group, but these two were the ones most damaged by the cult of Byron. It’s also quite shocking how young they were. John, taking employment as a doctor, was only 20, Byron 24 and Claire younger still. I think they were the first of the live fast, die young generations. But they were very forward thinking for the time, and they could easily be transplanted into the present day. Perhaps they’d be a bit odd, but writers are allowed that. Anyone wishing to write Byron into their novel as a character should pay attention. He wasn’t romantic, he was snarky. I found his level of snark quite amusing, but John wasn’t thick skinned enough to hang around with him. His words were taken badly and verge on bullying when Byron doesn’t take heed of John’s distress. I found the history of the publication of The Vampyre fascinating. It’s considered as the first example of the modern day vampire (yes, before Dracula) and it also was born out of that rainy day game that gave us Frankenstein. The Vampyre was originally a vague outline that Byron wrote and discarded, and John picked it up and made it his own. Clearly inspired by his treatment at the hands of Byron himself. But what happens later shows that piracy, plagiarism and copyright battles are not a new thing. If they were alive today, Byron and Polidori would be at the centre of author meltdowns I’m sure! Overall a fascinating book for anyone interested in gothic fiction or the lives of literary heroes. It’s not a fictionalised account, so if you’re after a page turning novel, it may not be for you. The Vampyre Family is published by Canongate and will be available in an attractive hardback or ebook editions from 7th November 2013. Thanks go to the publisher for providing a copy for review. Shelve next to: Frankenstein by Mary Shelley and The Vampyre by John Polidori. The Vampyre Family sounds excellent. I'd like to read more on Polodori and Clairmont especially, since they're the less notable of a very notable party. My view of Polodori has been colored by Ken Russell's film Gothic. While being entertaining and utterly gonzo, that movie is probably not a very accurate. It casts Timothy Spall as a not-at-all handsome Polodori. But it's Byron is pretty snarky. This book is going on my Christmas list, for sure! I've loved the story of that summer ever since I was first introduced to it when studying Frankenstein for my A-Level English Lit. WANT WANT WANT WANT ALL THE BYRON WANT. I read a novel by Tom Holland yeaaaars ago called 'The Vampyre', which theorised that Byron was ACTUALLY turned into a vampire during his travels. It explained his apparent attractiveness to every young lady he came across, and also tied in to the origins of Polidori's story. SO MUCH FUN. This looks BRILLIANT! Definitely one to add to my wishlist... as if I didn't have piles of books waiting patiently to be read.